In the olden days—but not so long ago—a high school’s gymnasium served as the primary space for athletics and physical education. It was also the only place large enough to seat the entire student body, so it doubled as a space for student assemblies, community activities and special events such as graduation. While the standard gymnasium is still designed to host these events, requirements of seating, sightlines and sports flooring can actually limit their opportunities for flexibility. 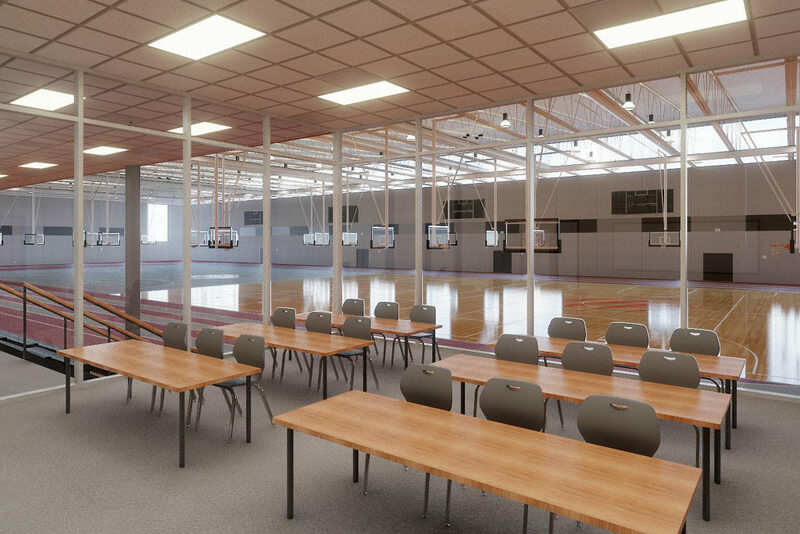 To offer activities past the limitations of a gymnasium, the solution for larger high schools has been to construct a fieldhouse. 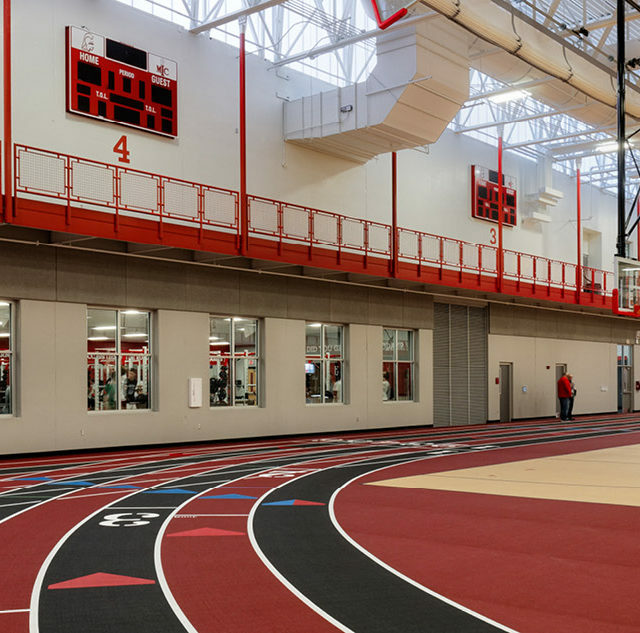 As a free-standing, independent building, a fieldhouse takes advantage of unencumbered space, allowing multiple courts and indoor running tracks to operate simultaneously with the added benefit of a secure and controlled environment. But in the same way high school stadiums have evolved to accommodate multiple events, the fieldhouse is also being rethought to maximize its value to the school and its community. 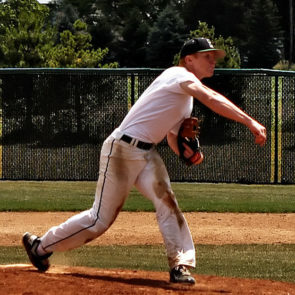 When carefully integrated with a high school campus, fieldhouses become an invaluable center of student activity and a ‘workhorse’ space for both the school and community. Enter the evolving movement toward Student Activity Centers (SACs). The design of SACs reflects the overall trend of hybridization in educational buildings, a trend in which spaces are designed not to serve one or two purposes, but many. School districts are looking to SACs as a space that will be used beyond the typical school hours by a wide variety of students, staff and the community at large. Community members and students alike enjoy the fitness benefits of Center Grove’s new student activity center. A recent SAC at Zionsville High School, in Zionsville, Indiana, was designed to provide a dynamic new entrance and pre-function space in support of its varsity gymnasium. Spectators are able to grab game-time food at a café-like concession stand that doubles as a daily dining option for high school students. Another important component of SACs is their connection to the rest of the school. Newer designs envision a synergy of public spaces surrounding the SAC: student-led cafés, community service rooms, hospitality suites and more. The idea is to have a hot spot where people can gather for specific events, or just spontaneous meet-ups. 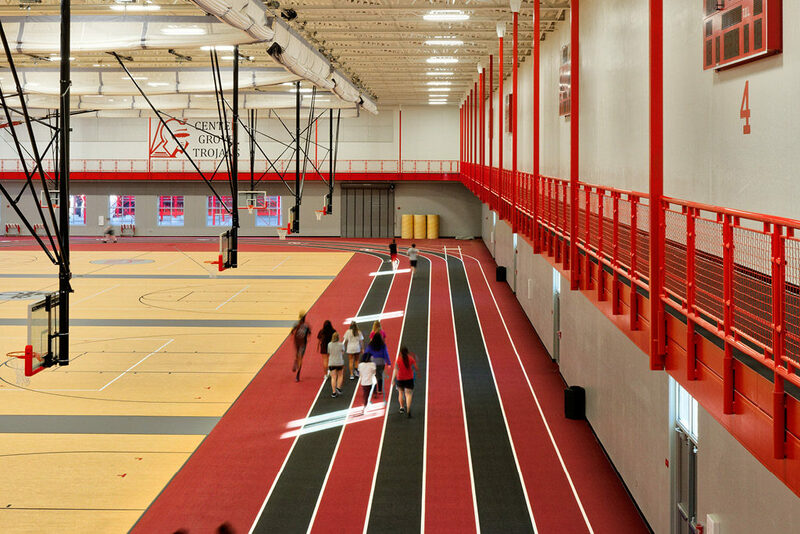 Center Grove’s SAC was designed to create a public-way that connects all of the primary indoor athletic facilities. It provides a shared space for public gathering and can also operate independently of the high school. Its direct connection to the varsity gym has allowed teachers and students to dream big—the school can host a state-level robotics competition by using the SAC for pit areas, power and demonstrations, and the varsity gym for the main spectator competition. Warsaw High School in Warsaw, Indiana, is even plugging a health clinic in to their SAC run by an outside vendor leasing the space. Rather than trying to keep people out of the building, they’re finding new ways to open their doors to benefit the entire community. Warsaw’s new student activity center will feature classrooms, childcare facilities and a community health clinic. This is the sort of next-generation thinking that is driving the concept of student activity centers. School districts and communities are partnering more than ever before. Educational leaders realize that the vitality of their school and community is increased when they reach beyond the bubble. Additionally, the case for investment in school facilities is easier when everyone benefits. A generation ago, school districts were more hesitant to partner with outside groups, but this is evolving quickly as districts and their neighbors experience success. Forward thinking districts are looking for ways to be more transparent in their purpose, both in the way they use resources for education and for actively displaying their value to their communities. The next generation philosophy is that SACs belong to the entire community, and provide an increasingly connected and vibrant facility for student and community events. With fresh designs and new thinking, student activity centers are an exciting way to help schools become the center of their communities again.